For Gloucestershire couple Andrew and Jenny Roberts, Bovis Homes' Home Exchange scheme offered them a welcome chance to stay in the village they love - and saved them thousands of pounds in the process. 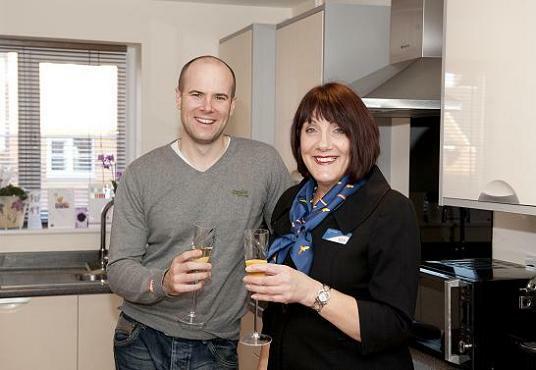 In fact, so smooth was the process of selling their old property to the national housebuilding company and then moving into a new Bovis Home that product manager Andrew and buyer Jenny ended up being the first people to move into The Homelands at Bishop's Cleeve, just outside Cheltenham. Click to see how Home Exchange could help you. "We were already living in Bishop's Cleeve and really wanted to stay in the village," said Andrew. "But we were keen to move and buy a brand new property as we were looking to stay in our next house for at least the next 10 years. "Home Exchange made the process much easier than we could ever have imagined. We have avoided all the stresses and pitfalls you would normally associate with a move and the settling-in period has been made all the easier with plenty of courtesy visits from Jim from Bovis Homes checking that everything is okay." Home Exchange is Bovis Homes' part-exchange scheme where the homebuilder will arrange for at least two local estate agents to value the buyer's existing property and then, if the house is suitable, will advise the buyer what they would offer for the home. The property being sold should be worth no more than 75% of the value of the new Bovis Home being bought. It cuts out frustrating chains and costly estate agent's fees. What's more, it meant Andrew and Jenny could carry on living in their existing house until their new Bovis Home was ready to move into. "Before we sold our old house we did get an additional valuation of it which matched the figure Bovis Homes was offering - so it all seemed fair," said Andrew. "I would say in the end we saved about £2,500 in estate agent fees." Now they have moved in, the Roberts are able to continue to enjoy Bishop's Cleeve, living in a brand new three-bedroom semi-detached house called 'The Southwold' with attractive open-plan design and French doors opening out into the rear garden. Upstairs, there is an en suite leading to the master bedroom and the home comes with the usual all-inclusive specification, including fitted kitchen. "As well as the great location we particularly liked the house and the idea of a totally open downstairs with the kitchen leading into the living room," said Andrew. "It's perfect for us and we intend to be here for many years to come."